Hotels (2000-2002) are a series of color photographs of Yugoslav hotel interiors, representatives of the local 1960s socialist modern design. Empty and deserted, with a lingering atmosphere of past times, these spaces have become spectacles of anachronism. Those interiors, observed in the series as non-spaces, bring back the atmosphere of the “golden age” of Yugoslav socialism, the psychology of the times, and how it is shaped in constructed spaces. Small exhibitions of the Hotels images were staged in hotel rooms, brought back to its places of origin, being on view only to the hotel guests. 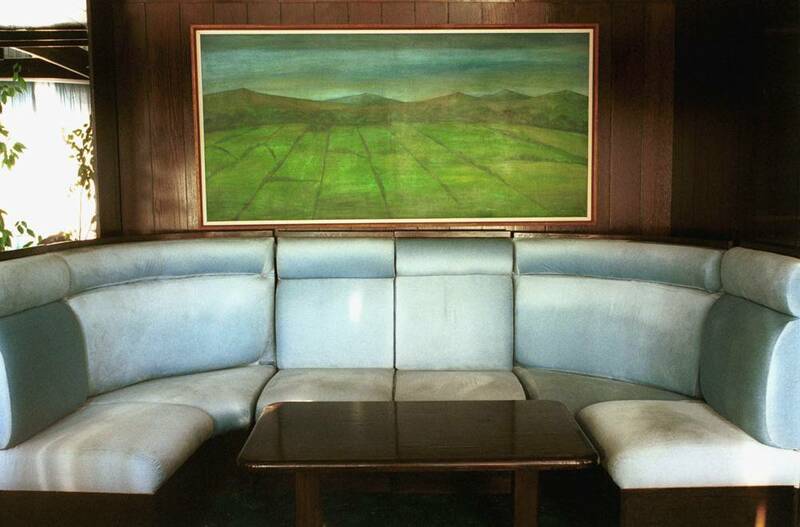 “Mixing deadpan observation and richly speculative imagination, Vesna Pavlovic photographs the interiors of the once-grandiose hotels that were built during Yugoslavia’s “golden age” in the 1960s and ‘70s. Like many of her artistic contemporaries, Pavlovic is less interested in analyzing the formal aspects of architecture than in evoking the collective psychology that shapes constructed spaces. With an ironic precision, she registers the colors and patterns of carpets, the textures of wall coverings, the fabrics that adorn curtained windows, the design of decorative objects, and the arrangement of room furnishings. Together, these details evoke the complex aspirations –sometimes laudable, sometimes laughable –that characterized a particular era of East European socialism. Vesna Pavlović (Belgrade, Serbia) obtained her MFA degree in visual arts from Columbia University in 2007. She is an Assistant Professor of Art at Vanderbilt University where she teaches photography and digital media. Her projects develop as anthropological studies, analyzing different cultures and their visual representations through particular phenomena. She has exhibited widely, including solo shows at the Frist Center for the Visual Arts in Nashville, Museum of History of Yugoslavia in Belgrade, the Crocker Art Museum in Sacramento, and The Phillips Collection, Washington DC. She has been featured with a solo presentation at the 12th Istanbul Biennial in 2011, and group exhibitions at the Museum of Contemporary Art in Belgrade, Tennis Palace Art Museum in Helsinki, Carinthian Museum of Modern Art in Klagenfurt, Austria, Photographers’ Gallery in London, Kettle’s Yard in Cambridge, and FRAC Center for Contemporary Art in Dunkerke, France. Vesna Pavlović is the recipient of Robert Penn Warren Fellowship at Vanderbilt University and the Helene Wurlitzer Foundation grant and artist residency in Taos, NM in 2011. Her work is included in the permanent collections of the Hirshorn Museum and Sculpture Gardens and the National Museum of the Women in the Arts in Washington DC, Crocker Art Museum in Sacramento and the Museum of Contemporary Art in Belgrade among others.